What's Up with Harmony Core? Interested in some consulting help from Synergex? Join us at one of our educational Tech Days, an all-day, informal, classroom-style gathering for Synergy developers and development teams, focused on adding significant value and productivity for your Synergy developers. It’s a great opportunity for your entire dev team, especially those who haven’t been to the DevPartner Conference, to get to know our team at Synergex. 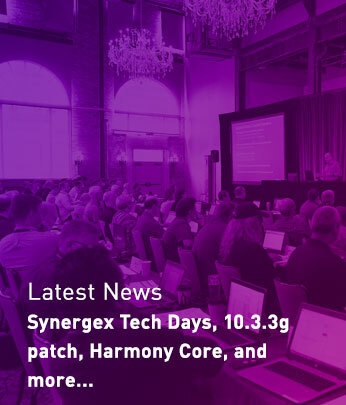 If you attended the 2018 Synergy DevPartner Conference in New Orleans, you probably remember hearing about Harmony Core. Harmony Core is Synergex’s open-source solution for allowing access to the data and logic in your Synergy applications. We want to share our plans for the near future so you know what to look forward to and what to expect from us. Synergy/DE 11 will deliver many exciting new features, including automated product key updates, enhanced encryption security, improved ISAM file reliability and performance, and vastly improved load performance for large solutions in Visual Studio. Learn more about v11—including some new requirements—and get ready to beta test it later this month. Interested in some consulting help from Synergex but not sure where to start? Our Professional Services team of experts can help with everything from the generic (system assessments, documentation, staff augmentation), to the specific (Visual Studio migration, building RESTful web services, data replication). Let us help you achieve your development goals. As a reader of anything technical, you have likely heard the buzz about DevOps. You may already be familiar with this concept, but if you’re even a little fuzzy about it or the development culture that has grown up around it, this article should help you understand what DevOps is, how it works, and what it can do for you and your company. Traditional Synergy is Ready for Visual Studio. Are you? The Synergy DBL language does not have built-in functionality to delete a directory, the way XCALL DELET deletes a file. However, it's possible to open a pipe to an operating system command that will delete a directory. The benefit of running the command in an open pipe versus shelling the command is that an OPEN pipe enables you to examine the output for code errors without having to create a file. In contrast, using the SHELL technique to check for errors requires the output to be redirected to a file, and then that file must be opened and parsed. For example, on Windows the command below will delete a directory containing files in an open pipe. The "2>&1" redirects standard error to standard out, so that errors (if any) are redirected into the pipe. Similar commands can be run in an open pipe on other platforms to achieve the same results. Alaska is the only American state that can be typed on one row of a traditional QWERTY keyboard. Can DevOps Work for Small Organizations?